Because of the ban on imports of European plastic waste impeded by China at the beginning of 2018, Europeans urgently need to find another solution. The EU commission, for example, is considering a “plastics tax”. An EU directive against lightweight plastic carrier bags has already contributed to a reduction of consumption in many countries. Until 2030, all packaging in the EU ought to be reusable and made of recyclable materials. 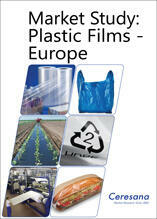 Ceresana analyzed the European market for plastic films. Included in this market are plastic bags and sacks but also packaging films, shrink and stretch films, agricultural films as well as other films such as construction films. The study examines films made of polyethylene, polypropylene, PET, PVC, as well as other plastics (as an aggregate). Manufacturers do not need to worry about demand: The analysts of Ceresana expect the market for plastic films in Europe to increase to about 14 million tonnes until 2024. Packaging should be light, visually appealing, and microwavable; they ought to present the content well, help to increase the durability, and contain the intensity of flavor over a long period of time. Accordingly, the pressure on film producers to meet the continuously rising requirements regarding optics, handling and barrier properties, as well as conservation of resources and sustainability is high. Requirements do not only increase for flexible packaging but also for bags and sacks, shrink and stretch films, agricultural films, and other films. In defining films, sheets, and boards, all products from wafer-thin films to thick, rigid boards can be found. The focus in the present study is on flexible films. This study does not cover sheets and boards as used in the manufacturing of rigid packaging, e.g., boxes, cartons, and cases. Rigid sheets and boards utilized in construction and industrial applications are not included either. Besides the trends of the consumer goods market, numerous other factors influence the demand for plastic films on several national markets as well. Many EU countries in particular try to contain the demand for light-weight carrier bags. The implementation of the respective regulations, however, varies considerably from country to country. In contrast, demand for secondary and transport packaging such as shrink and stretch films depends on the macroeconomic development and the consumer climate of the respective country. In some countries, the efforts to intensify agriculture propel the use of agricultural films. The demand for construction films corresponds to the order situation of the respective construction industry. These factors are analyzed separately in the individual country profiles (chapters 1.2 to 1.27). The plastic BOPET (biaxially oriented polyethylene terephthalate) provides a high transparency, high-quality visual appearance, and a high tensile strength – ultra-thin and light films can be made thereof. For further reduction of thickness and weight of packaging (downgauging), BOPET plays a major role. BOPET helps to increase the durability of perishable food with its barrier properties and is, for example, used for aroma-proof packaging. Thin BOPET films of about 8 to 50 µm are mainly used for FMCG (fast-moving consumer goods) packaging, thicker films of up to approx. 350 µm are rather used for stationary or electronic goods. BOPP (biaxially oriented polypropylene) is mainly utilized for foodstuffs packaging. However, BOPP films are not readily heat sealable. As this is a prime requirement for packaging films, BOPP is normally given a surface coating of a heat sealable polymer such as a coextruded polypropylene random copolymer. Copolymers for heat seals need to exhibit a high gloss and transparency. Coating or coextrusion increases the barrier properties of BOPP film, decreasing its permeability to gases. Common barrier polymers are ethylene vinyl alcohol, polyvinylidene chloride, and polyamide. Chapter 1 analyzes demand for and production of plastic films (in 1,000 tonnes) as well as revenues generated with plastic films (in billion US-dollars and billion euros) for 25 countries. Furthermore, the study analyzes the demand for plastic films split by the several plastic types as well as split by the individual application areas. Chapter 2 offers a detailed presentation of various application areas of plastic films: Data on demand development in the applications packaging films, bags & sacks, shrink & stretch films, agricultural films, and other films (in tonnes). Chapter 3 examines the demand for films split by the types of plastic PE, PP, PET, PVC, and other plastics. Chapter 4 provides company profiles of the largest manufacturers of plastic films – clearly arranged according to contact details, revenues, profit, product range, production sites, and profile summary. Extensive profiles of 87 manufacturers are included, such as Amcor Ltd., Bolloré Divisions Films Plastiques, Constantia Flexibles Group GmbH, Covestro AG, DowDuPont Inc., Eastman Chemical Company, Evonik Industries AG, Exxon Mobil Chemical Company, Mitsubishi Corporation, Saudi Basic Industries Corp. (SABIC), and Toray Industries Inc.